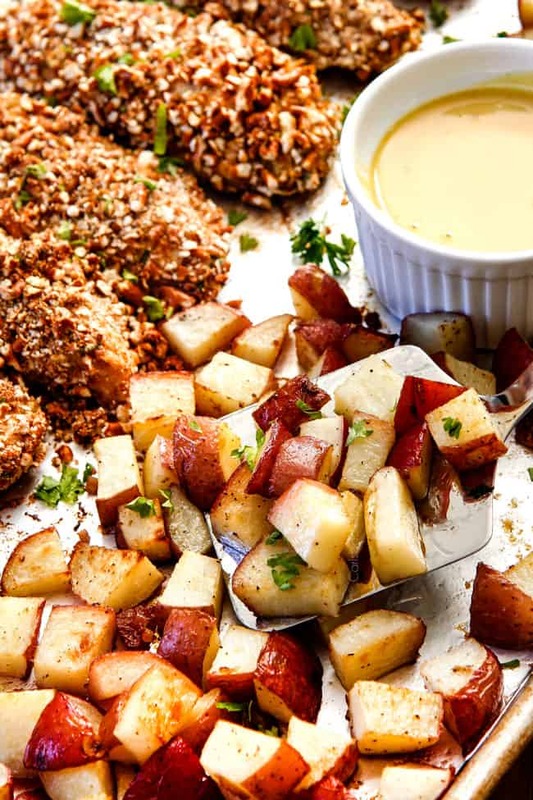 SHEET PAN HONEY MUSTARD PRETZEL CHICKEN & Potatoes bursting with irresistible crunchy chicken, melt-in-your-mouth potatoes and the Honey Mustard Sauce is perfection! This Sheet Pan Honey Mustard Pretzel Chicken & Potatoes is practically a meal-in-one that everyone will rave about! 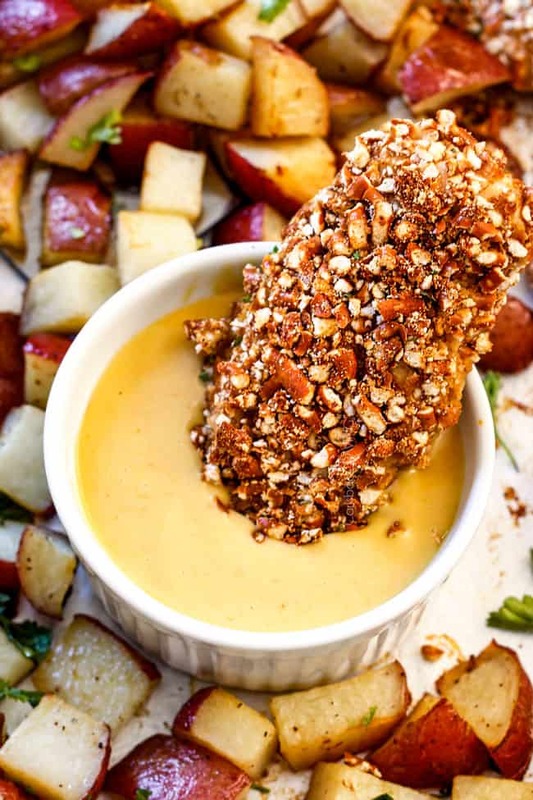 The pretzel crusted chicken tenders are first coated in irresistible honey mustard sauce then rolled in crushed pretzels for a crunchy outside, tender inside that is addicting all over. I love coated chicken tenders from my Best Oven “Fried” Chicken to Baked Ranch Chicken Tenders to Cajun Chicken Tenders. By coating chicken in either panko, breadcrumbs, crackers or pretzels we achieve a delightful crunch without frying our chicken – winning! This also means less guilt when dunking in our creamy Honey Mustard Sauce. And you are going to want to dunk everything in this Honey Mustard Sauce. Can we agree honey mustard makes everything better? From Baked Honey Mustard Chicken to Cajun Honey Mustard Chicken to Cobb Salad with Honey Mustard Chicken, I’m a HUGE fan. This Honey Mustard Sauce adds a sweet and tangy, luscious factor to this already delicious Pretzel Chicken. Just like pretzels + mustard belong together and chicken + honey mustard belong together, PRETZEL CHICKEN + Honey Mustard belong together. You could substitute the Honey Mustard for your favorite BBQ sauce but if you like mustard even a little, then I suggest you first try the Honey Mustard Pretzel Chicken! 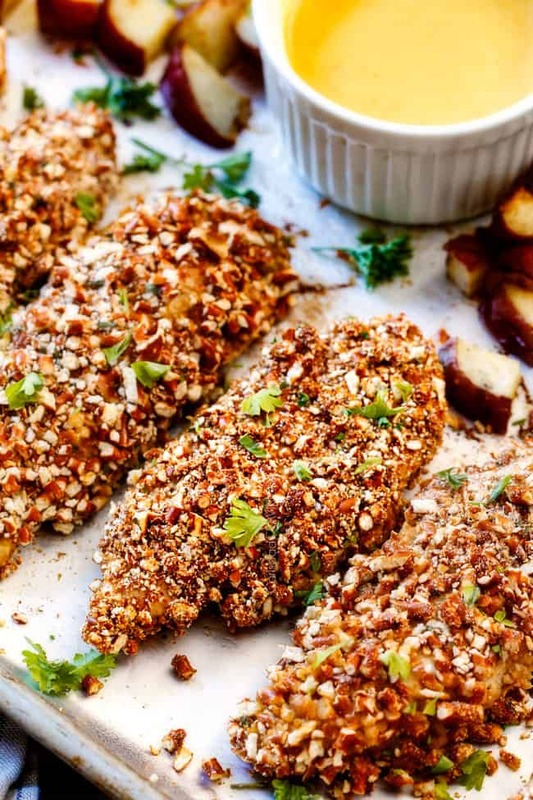 Because this Pretzel Crusted Chicken is salty, crunchy with a sweet and tangy undertone that gets magnified when the tenders dive into the Honey Mustard Sauce. The pretzel coating not only provides a textural dream, it protects the chicken while baking so it stays nice and juicy on the inside. The other star of this Sheet Pan meal is the potatoes! The tender morsels get tossed in olive oil, salt, pepper and 1 tablespoon of Honey Mustard Sauce so they soak up flavor as they bake into melt-in-your-mouth tender forkfuls. Add a salad and you have a quick and easy meal-in-one your whole family will love! This Sheet Pan Pretzel Chicken with Potatoes comes together rather quickly. First, whisk together the Honey Mustard Sauce ingredients that are all pantry staples: mayo, honey, yellow mustard, Dijon mustard, cider vinegar and hot sauce. You can even make the Honey Mustard Sauce days in advance if you want. Next, line a baking sheet with foil for easy cleanup and lightly grease with nonstick cooking spray. Add potatoes, 1 tablespoon olive oil, salt, pepper and 1 tablespoon Honey Mustard Sauce. Toss until evenly coated then spread potatoes out evenly. Bake for 10 minutes at 400 degrees. By giving our potatoes a headstart in the oven, we ensure everything will be finished baking at the same time. It is important that the potatoes are cut into small 1/2″ cubes so they don’t require longer cooking time. If for whatever reason your potatoes aren’t fork-tender by the time your chicken is done, simply remove the chicken and continue to bake your potatoes. While the potatoes are baking, we prep our chicken. First, we combine 1/4 cup Honey Mustard Sauce with one egg this will become the “glue” that binds the pretzels to the chicken – all while flavoring the chicken a well. Next, rinse and dry your chicken then dredge it in the Honey Mustard Egg Wash with one hand and let the excess drip off and then use your opposite hand to dredge in the Pretzel Coating (pretzels and seasonings), pressing crumbs firmly into chicken so they stick. This simple trick of using one hand for the Egg Wash and one hand for the Dredging will keep your pretzel coating crispier and your hands cleaner! Stir your potatoes and push them to one side of the pan to make room for your chicken, then add your chicken and bake for 12-18 minutes, depending on the size/thickness of your chicken tenders. 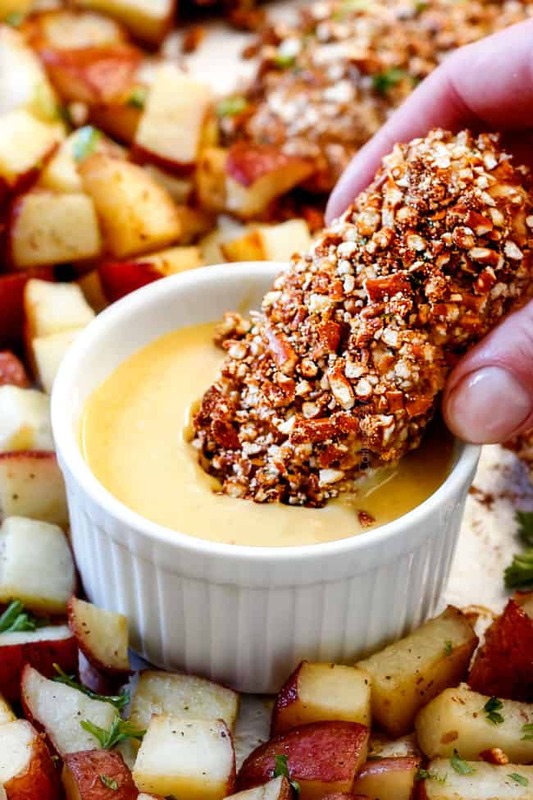 And then dunk your beautifully pretzel crusted chicken into the beautifully creamy Honey Mustard Sauce. 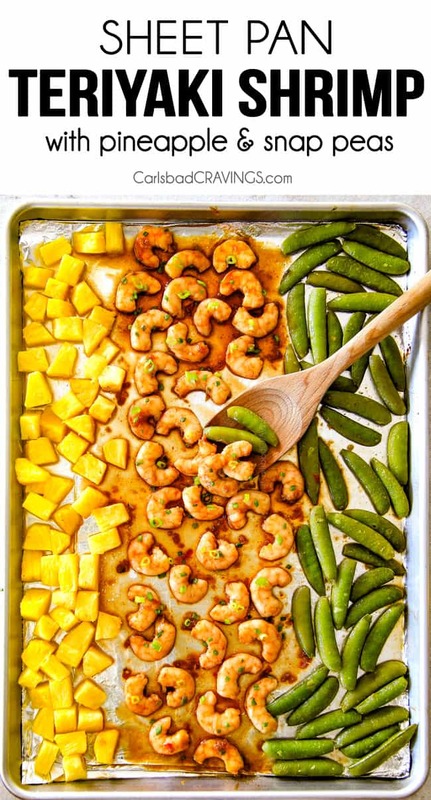 Looking for more sheet pan dinners? 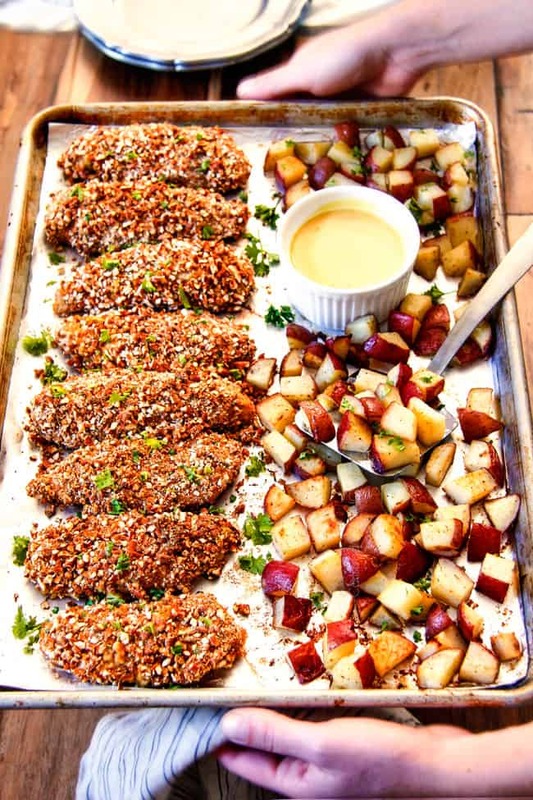 Want to try this Sheet Pan Honey Mustard Pretzel Chicken & Potatoes? Pin it to your CHICKEN, DINNER, or ONE POT WONDERS Board to SAVE for later! SHEET PAN HONEY MUSTARD PRETZEL CHICKEN & Potatoes bursting with irresistible crunchy chicken, melt-in-your-mouth potatoes and the Honey Mustard Sauce is perfection! 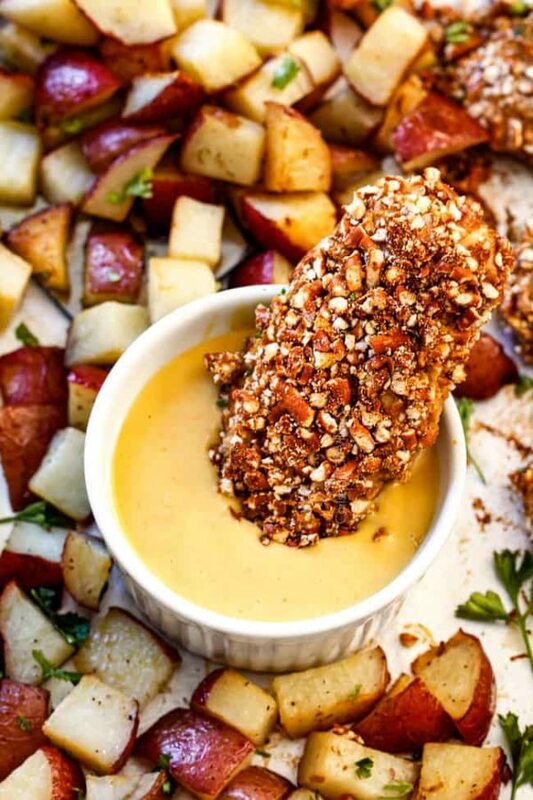 The pretzel crusted chicken tenders are first coated in irresistible honey mustard sauce then rolled in crushed pretzels for a crunchy outside, tender inside that is addicting all over. 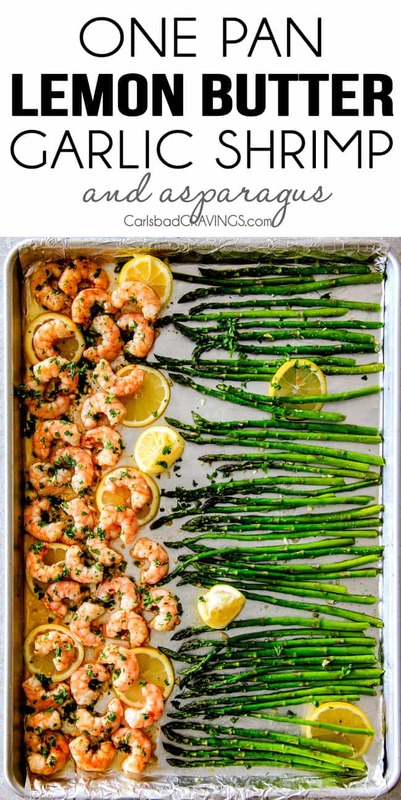 Preheat oven to 400 degrees F. Line a baking sheet with foil and spray with nonstick cooking spray. Whisk together the Honey Mustard Sauce ingredients in a medium bowl. Remove 1/4 cup Sauce to a small bowl and whisk in one egg (this becomes your “Honey Mustard Egg Wash”). Set aside. To prepared pan, add potatoes, 1 tablespoon olive oil, 1/4 teaspoon salt, 1/8 teaspoon pepper and 1 tablespoon Honey Mustard Sauce. Toss until evenly coated then spread potatoes out evenly. Bake for 10 minutes at 400 degrees F.
Meanwhile, whisk together Pretzel Coating ingredients in a shallow dish. Pat chicken very dry with paper towels. Dredge chicken in Honey Mustard Egg Wash with one hand, letting excess drip off then dredge in Pretzel Coating with the opposite hand, pressing crumbs firmly into chicken so they stick. Set chicken on oven baking rack to rest if your potatoes aren't out of the oven yet. Once potatoes have cooked for 10 minutes, stir and push potatoes to one side of pan. Add chicken in a vertical row as pictured and lightly spray with nonstick cooking spray. Bake 12-18 more minutes at 400 degrees F - just until chicken is cooked through. If potatoes aren't done cooking for whatever reason, then remove chicken from pan and continue to cook until potatoes until tender. Serve chicken with remaining Honey Mustard Sauce. My family is going to love this recipe! Going on the menu this week! thanks Jen! You are so welcome Nicole! I hope it’s a new favorite! My kids love chicken tenders too And are huge fans of your cheddar chicken tenders! I’m sure this will be another winner to add to “the book” which is mostly Carlsbad Cravings recipes! Thanks for making cooking fun again! Thank you so much for your awesome comment Sara! I am so honored and so happy that my site has helped bring you joy in cooking! I hope this recipe does indeed make it into the “book” and is a new family favorite! Thanks for making my recipes and taking the time to comment! Making this for company tomorrow night. Your recipes are always so wonderful and tasty that I never have to worry about trying something new with friends because they are always crowd pleasers…you rock sister!!!! You’re too sweet Suzanne, I hope you and your friends enjoyed it! Thank you!!! Have you ever tried this recipe with boneless pork chops? Hi Nicole, I’m sorry I haven’t. Let me know if you end up trying it! YAY! I’m so happy you loved this recipe and that it was JUST as good reheated – win-win! Thanks for taking the time to comment Julie! I especially love new comments on new recipes after people have tried them! I have to comment on this chicken, because my husband does not like chicken. And he told me it was very good. The kids loved it too. I am always afraid to put chicken in the oven for fear of drying it out, but it came out sooooo moist and delish!!!! Thank you for all your awesome recipes and for sharing them with us. This is my go to for new and delicious recipes. YAY! That’s awesome even the non-chicken-eater liked this chicken! And thank you so much for your kind words, it means so much to me that my site is your go-to!!! Ok Jen, this chicken was bomb! Cooked to perfection and loved that pretzel coating! yessssssss! I’m thrilled it was a hit! Thank you Layne! We tried this recipe tonight and it was so yummy! I used chicken thighs & baked them 30 min. They turned out crunchy on the outside and so moist inside. Absolutely delicious. Thank you for a great recipe. You are so welcome Cindy, they sound amazing with chicken thighs!! !